This is a report of a Sierra hike that covered ground south of Mammoth Lakes. As the following account makes clear, things didn’t go quite as planned. The text is mostly by Philosopher Backpacker David Hoekema, with some editorial tinkerings by Randall Bytwerk. The photographs are by Ed Van Beek and David Hoekema. A larger selection of Hoekema’s photographs is available. Saturday, August 1: The flight out. After the usual flights and drives, we all assembled at Mammoth Lakes in the evening. With a reasonably large group, some of whom haven’t backpacked before, it’s good to give people time to adjust to the altitude. We headed to the Tioga Pass entrance to Yosemite, and took the easy hike up to the Gaylor Lakes basin, We climbed the first mile over a low pass to Gaylor Lake, then continued to the Granite Lakes in a slightly higher basin and up to an area with abandoned silver mines, the shafts now closed off and the buildings reduced to a few walls and foundations. The weather was beautiful, apart from a powerful wind that nearly blew us off our lookout points over the lakes. Cotter, the youngest of the group, was thrilled to find that there were several snowfields along our route, and of course a snowball fight was soon underway. We stopped—of course!—at the junction of Tioga Pass Road and Highway 395 to have lunch at Whoa Nellie Deli, the fabulous little gourmet fast-food restaurant tucked inconspicuously into the Mobil station. Several people had the famous fish tacos, but this time I opted for crab taquitos, which were equally delicious (though the mango salsa was still partly frozen—an unexpected lapse). And of course we washed it down with a local ale on tap. Not your typical gas-station fare. We reported to the Mammoth Lakes Pack Station at 7 a.m. and left our backpacks to be carried by mule up to our first destination at Purple Lake, a ways past Duck Pass. It took more than an hour to get things organized and then to find the trailhead parking lot a few miles away, but we were on the trail, very lightly burdened, shortly after 8 and made our way past a chain of several lakes from the upper end of Lake Mary to Duck Pass, an ascent of about 2000 feet. It was a strenuous hike, but on a well-maintained and well-graded trail. We reached the pass sooner than we had anticipated, with immediate rewards in the form of magnificent views both back down the valley we had been in and forward to Duck Lake, one of the largest lakes in this area. It was about 6 miles to the pass, and the remaining three on the other side looked much easier on the map but involved lots of ups and downs. For most of the day Cotter was scampering ahead and then doubling back to rejoin his dad and the rest of the party, and the rest of us kept to whatever pace was comfortable: Jane and Kate tend to move along pretty quickly but take time to rest, Ed is slow on uphill sections but quick on downhills while I am just the reverse, except that I tend to fall far behind when there’s anything interesting to photograph, which there usually is. Deb keeps a moderate and steady pace but often gets to meeting points first because she never wants to rest for more than a minute except when we are taking a scheduled break. And Randy usually brings up the rear, hiking slowly but steadily. It’s a terrific group to spend a week with, with diverse interests and lots of topics for conversation. When we reached Purple Lake, which at 9900 feet is about 900 feet below the pass, we found that the packers had piled all our gear in the middle of just about the only campsite that could accommodate half a dozen tents, with water close by in a lovely rushing stream but not much of a view of the lake. We all got to the campsite by about 1:30 and had a relaxing afternoon here. We are in a rather thin forest—the tree line is not much above 10,000 feet here—and lots of sun gets through. Clouds moved in during the afternoon, unexpectedly, but brought no rain, and by evening the sky was clear again. There’s more of a crowd here than we anticipated, however. A little farther up the trail from the lake is a Boy Scout troop, and three Australians—mom, dad and 25-year-old daughter—are camped below us, a few nights into their Tuolumne-to-Whitney hike of the John Muir Trail. There are two college-age brothers from Binghamton in another wooded campsite, a young couple camped near the lake, and another party whom we haven’t seen but continually hear: they are camped with a couple of dogs who periodically set up a wild hunting cry as if they have some animal trapped in a tree. Not quite the solitude we were hoping for! But none of the other campsites is visible from ours. We set our dinner hour very early—5 p.m.—and built a campfire soon afterward. The Binghamton brothers, the older of them (early 20s or so) an intense sort of environmental mystic, came over to our campfire after dark—he’s as talkative as his brother is taciturn. But we were all in our tents preparing to sleep by 9. All except Ed, for two reasons: first, he never sleeps more than 5 hours, and likes to stay up and tend the campfire well into the night. Second, he has no tent but is sleeping under the stars. Two mishaps marred the day—one minor and quickly resolved, the other more worrisome. First, when we arrived at the campsite we discovered that someone had mistakenly tossed Randy’s duffel bag, with all the gear he did not want to take on the trail, onto the pile of packs for the mules to carry up to our campsite. Fortunately, a Forest Service pack team came by very shortly afterward (we sent Katie, as our youngest and fleetest of foot, to flag them down, since they were following the main trail well below our campsite—she came back completely exhausted but said they would look for us in an hour when they were headed back to the trailhead). They agreed to carry the bag down to the Mammoth Lakes ranger station. No one has confessed, by the way, to having taken the duffel from the trunk and placed it with all the backpacks. Maybe the mules went over and grabbed it in their mouths. The second mishap happened to Doug while he was washing up in the lake: he slipped while standing in the water, and a sharp rock put a rather deep cut into the side of his foot. He’s treated it with antibiotic cream and closed it up with butterfly bandages, but he’s probably going to rest tomorrow and then decide whether to continue with us or hike back out. What a joy it is to wake up with the sun—even though we do not get any direct sunlight in this valley til an hour or two after dawn—and hear the creek rushing past and the breeze in the pine trees! But we need to bundle up when we crawl out of our sleeping bags: the temperature dropped from about 60 yesterday afternoon to the high 30’s overnight. (Later mornings were even colder, but we never saw any ice in our water bottles.) Ed came equipped with a coffee percolator, a welcome upgrade from instant coffee. After more discussion this morning, Doug decided to head back out right away with Cotter rather than stay another day here. Randy accompanied them as far as the Duck Lake, saving Doug the work of carrying his pack for that stretch. He said he wasn’t experiencing much pain, even when walking, but he wants to get to a med center today to have the wound looked at. It took about four hours to reach the highest system of lakes, where we sat down and ate our lunches. Then we studied the map to figure out how to reach the next valley to the south and return by a different route. We scrambled up the lakeside slopes in the right general direction, and twice we thought we had found the route we were seeking, only to realize after checking the map and compass that we were looking down on another section of the Ram Lakes basin that we had not seen on our way up. Finally we clambered over yet another ridge—we were now up at about 11,000 feet—and were greeted by a magnificent panorama down a valley we knew we had not seen before, with the huge expanse of Virginia Lake far below. For the most part it was an easy descent, though there was a strong wind in our faces that sometimes stung our eyes with dust. We kept to the right side of the valley, since we wanted to avoid descending all the way to the main trail and then climbing back up to Purple Lake. About half a mile from the point where we thought the trail must lie, we set out to bushwhack over a ridge that, we hoped, would give us access to Purple Lake. The climb was long, rough, and very hot, and we couldn’t identify any landmarks to confirm that we were really on track. Moreover—I persuaded Ed after we studied the map again—the contours on the south side of Purple Lake showed that going cross-country all the way to the lake’s edge would be impossible without ropes. So we decided to drop down to the trail, which was a bit of an ordeal, sliding and slipping down a steep gravelly slope. Even after we reached the trail we had a hot and dusty mile or so of descent to the lake. The campsite was a welcome sight after seven hours’ strenuous off-trail hiking. We have no way of knowing just how far we hiked, but it was probably no more than 8 or 9 miles—for much the day we weren’t covering more than a mile an hour. Randy was waiting for us, and he hadn’t started to worry yet since it was only about 4. Dinner isn’t really a very communal event on a backpacking trip—Randy’s attempt to organize devotions before dinner doesn’t seem to be working out. (But my suggestion on the first morning—following the custom we always followed on our bus outings in Ghana—that we stand together and join in a word of prayer for the day each morning when we set out was received with enthusiasm and seems to be taking the place of anything formal at dinnertime.) We’re sharing four stoves among eight of us, and generally we start water heating up on several and keep refilling til everyone has what he or she needs. The result is that we each sit down and eat out of our individual foil pouch when the food is ready, except Jane and Kate, and Doug and Cotter, who brought some meals to share. Still, we are usually all hanging around the stoves and the campfire area from dinner time til we retire for the night, reviewing the day’s activities and planning the next day’s, or taking up other topics of conversation that range from health care reform to Calvin’s budget challenges to worthwhile films we’ve seen. Tonight I don’t remember what we were discussing, but it kept us up really late—I think most of us stayed up til 9:30! And we tend to be up and about as soon as it’s fully light at 6 or 6:30. In effect we’ve living somewhere between Eastern and Pacific time, I guess. We’ve abandoned our ambitious plan to hike south to Tully Hole and on to camp at Horse Heaven, then take our last two days to cross 12,000-foot McGee Pass. Randy decided this morning that this was another of his overly ambitious January fantasies, when he forgets that he’s not 30 anymore. Slogging up 3000 feet of elevation, two-thirds of it above tree line and completely exposed to the sun, with full packs just doesn’t sound like his idea of fun now that he’s in the realm of reality and not fantasy. I’m a little disappointed—there’s nothing quite like cresting a really high saddle to make you feel like you’ve really accomplished something!—but nobody else is lobbying for the original plan, so I didn’t either. And I suspect my confidence about doing it would have lasted, say, for the first 1000 feet of the ascent. Weather is a factor too: we had a very windy night, and when I woke up this morning there was a fine film of grit on everything inside and outside my tent. It looks as if there may be some heavy weather on the way. Add to this the unexpected crowds on this section of our route—which is along a section where the John Muir Trail has joined the Pacific Crest Trail, after all—and we have numerous reasons not to continue along the trail heading south. So we broke camp this morning and retraced our steps over Duck Pass, this time with all our gear, and tomorrow we will return to Mammoth Lakes and pick a new trailhead for the remainder of our trip. Rangers whom we met on the trail said the forecast is for some rain today and tomorrow, with snow above 10,000 feet. Clouds kept coming and going all morning as we hiked—offering some welcome relief from the sun’s intensity when we were above tree line. I was glad to have a chance to follow the trail alongside Duck Lake again, which is on a north slope ablaze with wildflowers. That stretch, with the lake glistening in the sun below, is as pretty a stretch of trail as I’ve seen anywhere in the mountains. And I kept dropping behind the others to lie on my belly searching for the right angle from which to capture the beauty of the flowers. I didn’t see that the others had stopped at the pass for lunch, however, and mistook a party far ahead of me for our group, thinking I’d fallen back even farther than I realized. So I hurried down the trail to our agreed meeting point at the first access to Skelton Lake and then got very worried because no one was there—I thought the others must have found the camping options poor and gone farther down the valley. So I decided to wait for Randy at the meeting point. Better two of us bringing up the rear than just one, I thought, and we could camp together if we didn’t find the others. About half an hour later, the rest of the group except Randy caught up with me! It was someone else’s bright orange shirt that I had seen far ahead of me coming down from the pass, not Ed’s. Soon we located a spectacular campsite here with beautiful views of the lake on three sides. As I write, the water is sparkling in the sunlight while fluffy white clouds whiz past overhead. We arrived at the site by about 2:30, and tomorrow morning we expect to be back at our cars in an hour or two. Descending, I find, is easier on the hips and quads and heart but harder on the knees and feet, and on our first day of fully loaded hiking my feet have taken quite a beating. And if we thought it was crowded at Purple Lake that was nothing compared to the trail today: I think we met no fewer than fifty hikers today, mostly on this side of the pass. They included day hikers, fishermen, through hikers pounding out the miles, and one or two families in sneakers whose emergency kit consisted solely of one water bottle to share among four of them. Four or five parties are camped here at Skelton Lake. But the campsites are widely scattered, and we only catch an occasional glimpse of a tent, or after dark a campfire, from our side of the lake. In fact we’re surprised that this isn’t a much more popular camping spot, since it’s so easily accessible. It’s just past noon and I’m sitting on a log beside Davis Lake, looking over the lightly rippling water and listening to the sound of a waterfall a mile or more distant across the lake. (Yesterday I could never have heard that sound above the howling wind, and the lake would have been covered in angry little whitecaps.) The waterfall drops perhaps 80 feet from the top of a granite face, then hits a rockfall at the bottom and breaks up. I think it may be the source of the stream right beside our campsite at Davis Lake #2, the next lake up the watershed on this side of the ridge that separates Hilton Creek and its chain of 6 lakes from Rock Creek and the large lake that it feeds, which is accessible by road. The trailhead from which we began yesterday is just past Rock Creek Lake, and the first part of our trail before we entered the forested part of the slope gave us a broad view of it and the valley below. Today’s hike both began and ended at 9800 feet, which gave us the impression, together with the widely spaced contour lines on the topo map, that it would be an easy stroll. Wrong! It was about 4 miles of climbing, then 2 miles of descending, gaining and losing only about 600 feet but sometimes over pretty rough ground. And the weather did indeed offer some surprises: right at the moment we started up the trail it began to snow. It never amounted to more than a thin shower of – what should I call them? They weren’t snowflakes, but rather little spheres of snow that looked almost like hailstones, hollow pellets that landed ever so gently on our arms and heads. The snow never accumulated on the ground, and it came and went—indeed, there was a stretch when we were hiking in bright sunlight with snow falling all around us. I can’t recall any other time when I was hiking through snow showers but felt very comfortable in a short-sleeve shirt. We were in mature forest, with tall pines all around—no views, most of the time, and no sense of where the trail was headed. But each time we rounded a corner and saw another long ascent our packs seemed to get heavier. (And they were heavy—see the account of our supper below.) We never felt a drop of rain, and before long most of the clouds had blown past and the sky was a brilliant blue again. We continued around the north end of the lake, hoping to find a sheltered spot, with no success. And we had met nobody else headed in to camp in our area, or already camped there—because it’s just less used, or because everyone else had more sense than to defy the weather forecasts? Deb and I were tired, and feeling a bit discouraged about reaching our destination but still having no idea where we would be able to spend the night. My left foot was causing me a lot of pain, and Ed and Deb went ahead to keep looking for possibilities while I trailed along behind. Deb looked along the area of the lake outlet, toward Davis Lake, but found nothing usable. We were getting worried when 45 minutes had passed and Ed hadn’t returned to report on what he had found. When he finally showed up he said he’d made his way around to the one corner of the lake where the water was relatively calm, not whipped into a froth, and had found several well-established campsites there with plenty of level tent sites protected from the wind. But he had not found any way to get there except by crossing a wide and very wet bog and then wrestling through dense thickets of brush. We followed him, and to our immense relief found a splendid spot where the wind was no more than a brisk breeze. Connecting four campsites was a clearly identifiable trail—but none connecting that area with the main trail on the other side of the lake. There must be a better route than ours, but we never found it. We had set out at 1:00 and reached Second Lake by 3:30, but it was well after 5 when we finally set up our tents. It’s a perfectly lovely site, with lake views, a rushing stream right beside us for water, and a low ridge to the east that the sun clears by 6:30 in the morning. The fire pit we found at the site was gigantic, though, and full of cinders and garbage, completely unsuited for a campfire—it looked like an altar where you’d sacrifice an ox to Zeus. Ed set out building a smaller and better-designed one, with protection from the wind. In the morning Deb and I disassembled the big ugly altar, scattered the ashes, and rebuilt it as a table for cooking and sitting. We’ll pack out the metal and glass that we found as we dug out the cinders. Around Ed’s new campfire pit we enjoyed a wonderful supper, which was the reason for our heavy packs: we had packed in bratwurst to roast on sticks over the fire, good beer in bottles (Ed and I had selected four bottles each, for our two days—Deb compromised on two 22-oz cans to save the weight when we pack out), an onion to sautee over the stove, a jar of good mustard—what a feast! And a wonderful end to a day that had its anxious moments. THE GOOD NEWS: We have a splendid campsite on the E side of our targeted lake. Views, water rushing by, shelter from yesterday’s 30 mph winds, and no other campers for miles. THE BAD NEWS: You can’t get there from here. Not easily. Yesterday we went S around the lake (counterclockwise) and it was a very difficult route — bogs & bushes & no paths for half the distance. Today, I scouted the other route (clockwise) and it’s far worse — impossible with a pack. SEE YOU IN 45 MINUTES! Look for Ed’s orange shirt at our camp and follow the map. I set out along the lake’s south shore, hoping that was the easy route we had not found on Thursday. Not at all! The first half mile was a scramble over rocks and gravel, with no visible trail to follow but easy enough to negotiate. But then I came to a large rockfall that was very challenging with just a daypack and would have been close to impossible with a full backpack. It took me 45 minutes to pick my way from boulder to boulder and cover no more than a quarter mile of distance. So when I got to the junction I left a map and description of yesterday’s route for the others to follow. One benefit of my explorations today was finding a patch of Sierra lilies in glorious bloom, exquisite little yellow spotted trumpets that we have not seen anywhere else. I think the wildflowers are at their peak right about now, though a few favorites I’ve seen on previous trips, like the shooting star, have finished their season already. I could easily lie back on the forest floor here and sleep for the rest of the afternoon in the shade. But I’m going to return to our camp to see whether the latecomers have found their way there. Friday we were back to freeze-dried meals—the late joiners hadn’t thought to bring a fresh supply of beer and brats—and we enjoyed our last evening around a blazing campfire. Saturday morning we broke camp and had our brief devotions (I tried to lead the group in a song, which was such a disaster that I was glad I hadn’t tried to lead any campfire songs earlier) and were on our way by 8 am. The return trip to Hilton Lakes trailhead was a little easier than the outbound trip, with only a few steep ascents and descents. But carrying a full pack is still hard work, and for me descending causes more problems than ascending. We all proceeded at whatever pace was comfortable, with no group stops, and we were at our cars well before noon. Then came a stop at Rock Creek Resort—the “Pie in the Sky Café”—for burgers and slices of delicious (if very pricey) fruit pies. And showers! Then the other seven headed for Las Vegas and their midnight departure, following a shorter route across Death Valley that avoided the winding mountain roads of their trip to Mammoth Lakes. I headed south back to LA, with a brief stop at a hot spring I’d read about along Highway 395—ten minutes’ soaking in water as hot as I could stand felt wonderful after a week of hiking! So that was the 2009 Bytwerk expedition to the Sierra Nevada: eight hikers ranging from almost 13 to 59 in age, half male and half female this time; five or six nights out in the wilderness; about 20 miles of hiking with our packs and 20-30 more with daypacks, depending on which excursions each person joined; a score of exquisitely beautiful Alpine lakes and a million wildflowers; just one injury that proved not to be very serious. I’m grateful to Randy, who fell in love with these mountains three decades ago and generously invites the rest of us to join the excursions that he plans. And feeling renewed, refreshed, and just a bit tired. 1. With a group of 8, we rented a condo in Mammoth Lakes for two nights. I’d recommend it. Much better than a batch of motel rooms. 2.We probably should have expected it, but Purple Lake can be crowded. A nice lake, but if you like reasonable privacy, go elsewhere. Also, although both the Forest Service and packer told us that there had been no bear reports at Purple for the last several years, the folk at the next campsite said they saw one. It didn’t seem to cause anyone difficulty, and we were prepared with canisters, but if you go there, know there might be a bear in the area. 3. The trip to the far side of Lake #2 isn’t as bad as the note suggests. Stay above the shoreline as you work around the lake. There are two excellent campsites on that side, worth the effort to reach. The destination this year is the beautiful area south of Mammoth Lakes. We’ll start at Mammoth Lakes, being packed in the first day as usual. After that, we’ll meander through some spectacular country before leaving through McGee Canyon (unless we head out the way we came). The planned hike is about 30 miles. It looks like snowfall for the season will be under the average (bad news for California), so we’ll go with the early date. As of April 1, snowfall in the Southern Sierra was 78% of average. That means the bugs will be dead by the time we get there. August 1 (Saturday): Given the number of new expedition members, I’d like to spend a day in Mammoth Lakes (at 8,000 feet) to help acclimate people. We’ll fly to Las Vegas and Drive to Mammoth. I’ve reserved a condo that will sleep us all at a reasonable price. August 2 (Sunday) : Mammoth Lakes. I have a batch of favorite day hikes in the area. My favorite is the Gaylor Lakes area, above Tioga Pass, the entrance to Yosemite National Park, which easily takes us up to about 10,400 feet, and a lovely lake basin. August 3 (Monday): We’ll hike about 10 miles from Lake Mary (9055′) over Duck Pass (10,797′) to Purple Lake (9,928′), with our packs being hauled in by the Mammoth Lakes Pack Station. Campfires are permitted at Purple Lake. August 4 (Tuesday): Layover day at Purple Lake. August 5 (Wednesday): Hike about 6 miles through Tully Hole to Horse Heaven (around 9800′). Campfires permitted. August 6 (Thursday): Layover day at Horse Heaven. There are lots of interesting day hikes from here. 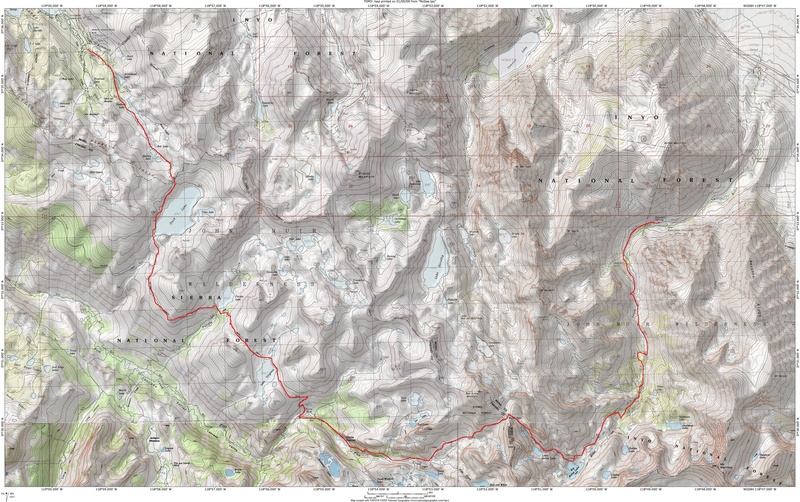 August 7 (Friday): Hike about 6 miles over McGee Pass (11,876′) to Big McGee Lake (10,600′). No campfires allowed. Alternatively, we could head back toward Mammoth, which would save the trouble of getting back to the car. We’d either return to Purple Lake, or find another site along the way. August 8 (Saturday): Hike out about 7 miles to the McGee Pass trailhead. August 9 (Sunday): Fly back to Grand Rapids. A report on the planned hike in reverse. A panorama of Purple Lake, our campsite for two nights. If you use Google Earth, enter “Mammoth Lakes, CA,” then move south, and you’ll be over the area.